A little change of pace today. I’ve been blogging on some pretty intense topics, so today I’ve got something light-hearted and, I hope, fun. Sit back, have some tea, and snoop around my back garden. First of all, meet Willow, who shades almost half the yard. Now what? I have a tree (Ivory Silk Tree Lilac) and 3 shrubs (a Limelight Hydrangea, a Summerwine Ninebark, and an Adelaide Hoodless Rose) to place somewhere. I know the picture below shows a Dogwood, not a rose or Ninebark — I have to move those from other places next spring. 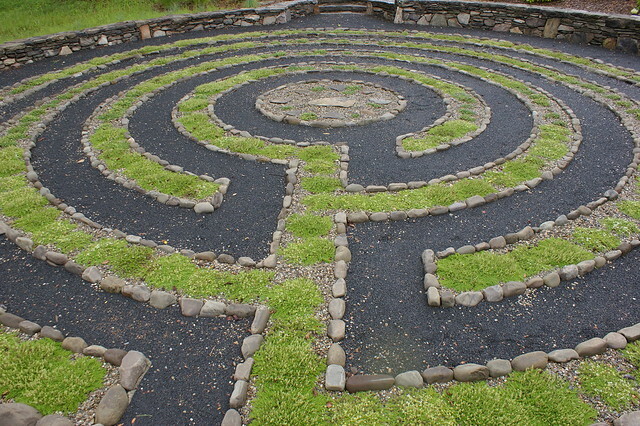 something under Willow as the grass suffers — a labyrinth? trellis/walls of some type to grow climbers and divide the space? If you have any thoughts or ideas please share below. Your garden is beautiful. I’d add more bee friendly flowers. Maybe a few easy vegetables. I made my mum angry growing rhubarb in a flower bed but it worked well and looked ornamental. Thanks for taking the time to comment and thanks for the compliment. 🙂 I added raspberry canes into the back corner of our sunniest flower bed, so I am with you on that. I also just ordered seeds from a local company — a wildlife mix of native wildflowers selected for their relationships either to bees, birds or butterflies. Can’t wait! Not sure what you mean by a laberinth, but surely you could replace the lawn w a ground cover that enjoys shade? I did a quick snoop and found these three, Birdsfoot Trefoil (lotus cornculatus), Bunchberry (cornus canadensis), and Foam Flower (tiarella cordifolia) on an Ontario website. Maybe something like that would be nice?